A warrior, she hopes to end up lead warrior, or delta. Rin is very and happy-go-lucky. :) She loves to laugh and smile, and to make others laugh. Though she is quick to lash out, she is slow to get truly angry. She doesn't hold grudges. She says what she thinks, sometimes offending the people around her, she will not tell a lie, but she may tell a half-truth, or part of the truth. SHe will accept any challenge, whether or not she likes the prize. 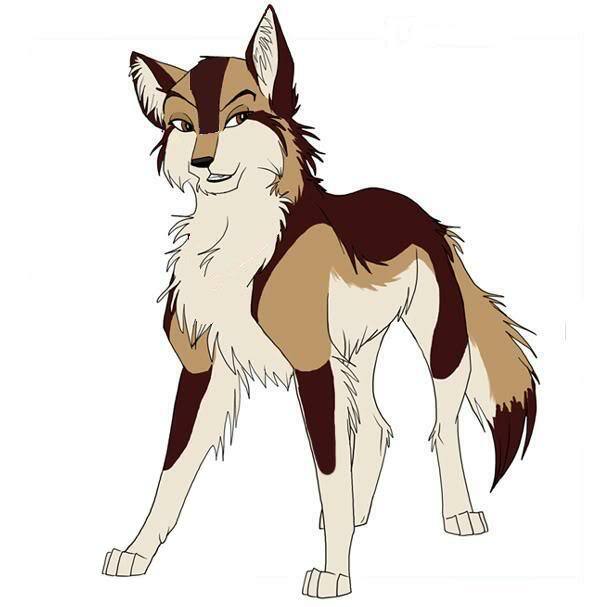 Farolin, along with two sisters and three brothers (Loki, Rowan, Fell, Takani, and Niamh), was born to a huge pack, of twenty one wolves other than them, bordered on all sides. As soon as the pups became apprentices they separated into two groups: Farolin, Rowan and Niamh, who were training for warrior, and Fell, Loki and Takani, who trained for sentinel. Kara decided that she wanted all her pups to know how to hunt extremely well, and so tutored them to perfection. When the apprentices finished their training, they all moved into their separate dens, and any remaining connections between the two groups split with the move. Loki was the heir to the pack, and when a few months later, Daiya, their father and the alpha, fell sick and soon passed, he took advantage, and turned the pack into an extreme dictatorship. While out hunting with Niamh and Rin, Rowan made a comment about changing the pack. Discussing it further, they decided to talk to Loki. Of course, he refused to change his ways, and Fell and Takani backed him up. Leaving as quickly as possible, Rin convinced their mother that Loki's way was not right, and she gathered close to five others. By now the whole pack had grown, and in total, the group was maybe thirty five. Kara recruited maybe six more wolves to their cause, one being a handsome silver-white brute, Hallow. They went out hunting together so as to plan their escape, and as their brother's reign grew steadily worse and harsher, they grew stronger, wiser, and their plan developed, as Hallow and Rin fell more and more in love. The night they decided to attack Loki's den was clear, cloudless and chilly. It was late Autumn, and Rin knew that if they didn't attack openly soon, they wouldn't be able to until after the winter's heavy snowfalls, and by then they would all be dead, as her brother had taken to killing any wolf he didn't trust. They stole through the camp that night, and pinned Loki down, making their demands: Half the territory would be theirs, they would be left alone, so on. Loki had no choice but to agree, and they left, marking the new border in the middle of the territory. Later, Rin wondered why they hadn't just demanded that Rowan be made leader... but then the ceremony would take place in daylight, were it would be their six against the fifteen of Loki's bloodthirsty dogs. That was all that remained... Farolin, Rowan, Kara, Niamh, Hallow, and two others, Jara and Chaos. The left, found a camp, and settled in to the new life, electing Rowan and Jara, who were now mates, as alpha and alphess. This was not to last. Not even a moon after winter had past, Loki brought his followers down on the small pack, fifteen to six. Jara died defending her near newborn pups, and the poor things soon followed their mother. Rowan, in despair, told the pack to run so that no other wolf would be harmed. They reached the outskirts of the territory safely, but Loki's followers soon caught up to them. Rowan stayed behind to cover his pack's escape, and they made it to the huge mountains to the north, on the outside of all claimed territory. Deciding that their only hope was to cross the mountains and start a new life, they reached half way up the mountain before the snow started to fall again. They were all fit, except for a few superficial injuries, and so they carried on. The snow fell so thickly now that they could hear each other, and all scent was buried under the icy flakes. They slowly travelled farther apart with Rin assuming that they would still be heading upwards, and the pack, assuming that she came back down to find them, headed back downwards. When Rin crossed the mountain, she never knew that she had crossed alone, howling for Hallow, though he couldn't hear. She wandered for months after realizing this, before crossing back, much farther north. That was when she found the Silver Snows Pack. She had loved someone in her old pack, but gave up on finding him long ago. She likes Atticus, but she hasn't realised it yet, because she's still hung up on Drake. Complications, losing loved ones, being mad at someone. She's not entirely comfortable in her own skin, though she hides it behind an aura of self-confidence. She is a strong swimmer, and forgives easily, though she is also good at holding grudges when needed. She is strong for her size, and a good swimmer. She can also run fairly fast, and has a lot of stamina. She fights well. She is not cautious or shy. She can be very ambitious. She has a special weakness for honey! Extra: HONEY. She is also very short, about a head shorter than the average wolf. This can be an advantage in hunting, but it's sometimes a hindrance when fighting. pretty xD Love the pic xD Welcome!